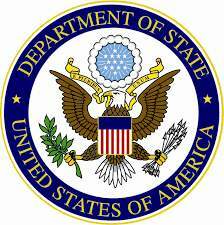 SANTA ANA, Calif. – John Wayne Airport (JWA) anticipates a busier-than-normal travel period from Thursday, August 31 through Tuesday, September 5 during the Labor Day holiday weekend. More than 169,000 passengers traveled through JWA during the same period in 2016 with the busiest travel days being the Thursday and Friday before and the Tuesday following Labor Day. Airports across the country are anticipating a record-setting year-end holiday travel season. 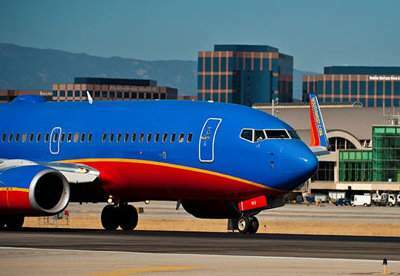 The Thanksgiving holiday is one of the most heavily traveled holiday periods, and passengers traveling through John Wayne Airport (JWA) between Friday, November 18 and Monday, November 28 will experience higher-than-normal passenger traffic. JWA travelers can visit www.ocair.com for real-time flight status, parking availability, and road closures and construction activity near the Airport. Color-coded and numbered columns make meeting arriving passengers easy. 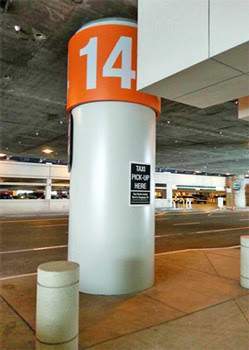 Column 14 is the JWA Yellow Cab pickup location for Terminal C.
SANTA ANA, Calif. – John Wayne Airport (JWA) anticipates a busier-than-normal travel period from Thursday, August 28 through Tuesday, September 2 during the Labor Day holiday weekend. More than 145,000 passengers traveled through JWA during the same period in 2013 with the busiest travel days being the Friday before and Labor Day. The hotel we know today as the Wyndham Irvine – Orange County Airport opened on August 1, 1986 and was initially operated as a Holiday Inn. It was purchased by the Wyndham Hotel Group, the world’s largest and most diverse hotel company with approximately 7,490 hotels worldwide, in August of 2013. The Wyndham Hotel Group invested ten million dollars in a renovation of their Irvine hotel and the rooms are now fully renovated. New furniture is going to be installed in the lobby this week along with new carpeting.